My car was stolen during the Super Bowl this past Sunday. I immediately contacted the police to notify them that it was stolen. The police performed a canvass of the area where it was stolen and checked their database to make sure that it wasn’t towed away. The police told me that the car would be entered into a national database of stolen vehicles and that I would be notified as soon as they knew anything. The police also informed me that they didn’t have any leads and there wasn’t much hope for the Creedence. I contacted my insurance company shortly thereafter and they informed me that the car was entered into the database as well and that 90% of the time stolen cars are recovered. . I received a call Thursday night notifying me that my car had been located. I went to assess the damage at the lot it was towed to today (Friday) and to my surprise there were parking tickets from Tuesday and Thursday on my windshield citing the location where the police found my car. If my car was ticketed Tuesday morning why did it take until Thursday night to get in contact with me? I asked the guy at the tow lot about the tickets and he told me that pretty much every single stolen car he gets comes in with multiple tickets on it. 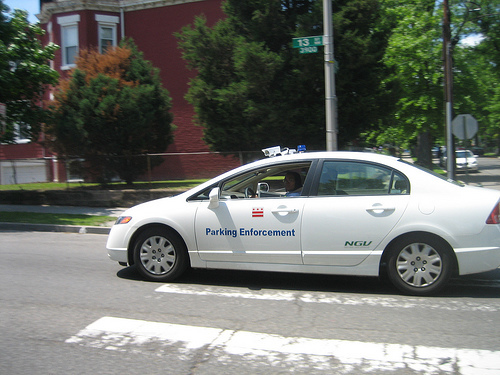 Why isn’t the system parking enforcement inputs their ticket info into synced up with the stolen vehicle database? That’s ridiculous. I only had to wait a couple of days and I applaud the police department for finding my vehicle but some people have to wait even longer and gather even more tickets when their vehicle is stolen. I came across a story from August 11, 2011 in which the same thing occurred and the car racked up $300 worth of parking tickets. According to the story my tickets will be expunged if I provide proper documentation but that requires me to go get a police report and then to have to go dispute the claim in person. If the police and parking enforcement were synced up properly I would have never received a ticket and my car would have been located earlier. In short, this seems like an easy fix. However, if the police and parking enforcement don’t fix this problem then I suggest that victims of car theft in DC go online to see if their car has any outstanding tickets while it is missing if they want to find their car faster.